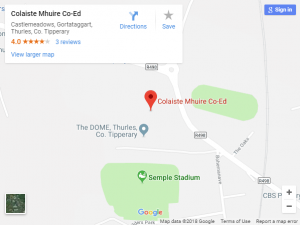 At Colaiste Mhuire Co-Ed we offer students a unique opportunity to do a 4th Year that is both enjoyable and prepares them for both their Leaving Certificate and the world of work beyond. Our distinctive programme places an emphasis on individual and personal development and promotes the general, technical and academic skills necessary to become involved in self-directed learning. Our 4th Year Transition programme builds on previous academic achievements and introduces the learning of essential skills for success in the Leaving Certificate, third level education and the workplace. In addition, unlike many schools we strive to make our transition programme as financially friendly as posssible on the parents. We do not charge exhorbitant fees but focus instead on the learning involved. Striking an ideal balance between school-based learning and fun out-of-school activities that have an educational output the programme offers a diverse range of modules which give students tasters of Leaving Certificate subjects while also allowing them to experience new areas of study. New subject areas such as Tourism, Architecture, Computer Aided Design, Web Design, Local Heritage, Literacy Tutoring, Health & Safety, Law, European Studies and Road Safety are introduced. In addition, intensive core modules in the areas of Maths, Irish, English and Modern Languages give students a clear understanding of the Leaving Certificate Curriculum, and also equip them with the skills required to achieve high grades in the Leaving Certificate. Moreover students get an opportunity to experience Biology, Physics and Chemistry before making a decision on what to focus on for Leaving Certificate. A varied range of certified sports activities are offered, including equestrian studies, boxercise, basketball, tae-kwon-do, FAI Soccer Coaching Skills, GAA skills and swimming. This complements our GAISCE president’s awards programme, which each student completes throughout the year undertaking challenges in the areas of Community Involvement, Personal Skills, Sports Skills and Adventure. A unique feature of the TY programme is our intensive enterprise module, incorporating both the Student Enterprise Programme and the NFTE Entrepreneurship Initiative which teaches young people to enhance their economic productivity by improving their business, academic and life skills and gives them the forum to channel their creativity in a profitable manner. NFTE students participate in a ‘Dragon’s Den’ where they pitch their business concept to a panel of local and national business experts and subsequently develop a business plan for a national and international competition. Our TY students have enjoyed considerable success in these competitions, winning substantial cash prizes. 4th Year students in Coliste Mhuire Co-Ed undertake an intensive ICT skills programme, within which they learn about the practical use of ICT in the business environment and are lucky to be able to tap into the skills of teachers who teach on the PLC courses. Within TY, students begin a process of career exploration which equips them with the skills and competencies necessary to make informed career and subject choices. This career exploration involves 2 sessions of work placement, where students get first hand experience of a chosen career, and can evaluate their performance and suitability for the chosen career. Students in the past have enjoyed placements in the areas of law, teaching, engineering, sports coaching, equestrian studies, administration, laboratory work and architecture. We welcome any feedback from parents and should any member of our community wish to contribute or give suggestions for improvement we would love to hear from you.